Latest News: AP ECET 2019 Exam Dates Announced. Andhra Pradesh ECET will be Conducted on 30th April 2019. Go Below to Check APECET Application Dates. The AP ECET Exam is only for the lateral entry students. The students who completed their Diploma and B.Sc Maths can apply for the Telangana ECET exam. Therefore, interested & eligible candidates can apply online before the last date, i.e., 27th March 2019. After applying online, the applicants have to check the exam dates. Exam dates are mandatory for any exam. By knowing the exam dates of AP Engineering Common Entrance Test, you can start your preparation. So, the applicants of AP ECET Exam must know the important dates. For the applicant’s urgency, we are providing the Andhra Pradesh ECET Exam Application mode, exam dates, exam mode, starting date of application and more details regarding the ECET 2019 exam in the below sections. Name of the Organisation Andhra Pradesh State Council of Higher Education. Institute Name Jawaharlal Nehru Technological University, Anantapur. Name of the Exam Engineering Common Entrance Test (ECET). AP ECET 2019 Exam Date 30th April 2019. The Jawaharlal Nehru Technological University, Anantapur issued a notification to fill the B.tech admissions. The Board of AP wants to conduct the AP ECET Exam on scheduled dates. Before the exam, the JNTU Anantapur released admit cards for the applied candidates. The applicants have to download the AP ECET Admit Card for attending the AP ECET Exam. The official website requires some time to release the exam dates of AP Engineering Common Entrance Test. We are giving the important dates as a reference for the applicants. We updated the exact exam dates on this page. You can also visit official notification for further more details. ECET Notification release date February 2019. Application Starting date 18th February 2019. Last date of ECET Application Form 27th March 2019. Last date for application submission with late fee of Rs.1000/- 2nd April 2019. Download ECET Hall Tickets 20th April 2019. AP ECET Exam Date 2019 30th April 2019. Aspirants who want to join in the B.Tech after their Diploma Course can check the ECET Application Starting Date and Due Date. It’s good to fill and submit the ECET Online Application as early as possible i.e., in the starting dates. So, initially check the AP ECET Exam Dates 2019-20. The AP ECET Application form available on the official website www.ecet.org or www.sche.ap.gov.in. Every individual who applied for the AP Engineering Common Entrance Test should know the exam dates compulsory. If you know, the exam dates you can prepare a timetable for your preparation. So, you can prepare well for the AP ECET Exam and score maximum marks. 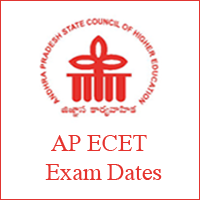 To know the exact exam dates of AP ECET follow our site.